If you'd like to become pen pals with Taylor, leave a comment below with your email address so Taylor can contact you and you can swap addresses. Don't forget to check out other pen pal calls, to get in touch with other people who are looking for a pen pal. Hi, I really want to be your pen pal. You have the most WONDERFUL of blogs. Honestly. Fantastic, fantastic idea with the letters, we need more people like this! I'm Camille, 16 years old, from France! My name's Paula and I'm finnish. I turn 16 this year. 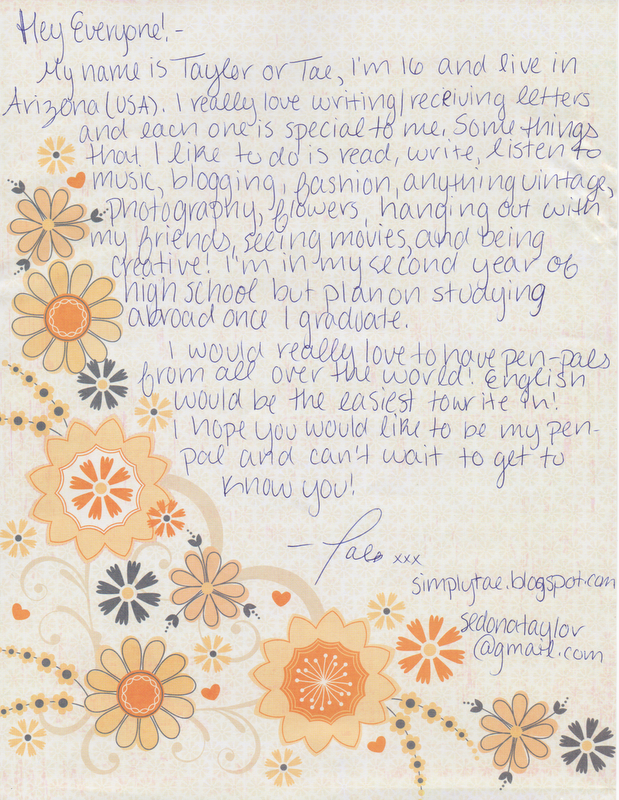 It would be nice to be your penpal so email me if you're interested ( kaarnalaiva96@hotmail.com). I'm Laura from Belgium and i turn 15 next month. I'm a 19 jear old Belgium girl and my name is Lotte. I don't know if you already found a penpal, but otherwise I'm intrested. Im Magda, 16 years old and from the Netherlands. hi , i would like that .